2 Tikes Under 2 & the Caboose! : When did she get so dang big? When did she get so dang big? Today my big girl was scheduled for surgery. She was having tubes put in and her adenoids removed....can we say scary? At least that is what I thought. And that was before I realized that not only would they be putting my baby to sleep, but they would also be putting a breathing tube down her throat. 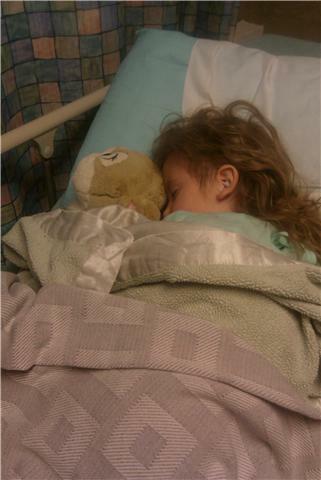 It's probably a very good thing I found out five minutes before her surgery started, otherwise I wouldn't have made it. My game plan for this surgery was to tell Meredith as little as possible about it, until the morning of. I knew we were doing this 2 weeks ago. Meredith knew a little bit, like she was now going to get some hot pink ear plugs to wear like Noah does. And that now when we go to visit the crazy Dr. H, he would be checking her ears out too. That part she loved. She also kind of clued in when her little friend Sam brought her balloons and a pink puppy dog. Yes, Sam as in Sam a boy. I know....she's only 4 years old and already has a boy bringing her balloons and stuffed animals. I have to say though, Sam is a cutie! Back to surgery....we arrived bright and early, signed in, where whisked away to the back, checked in by several nurses and then greeted by Dr. H. And speaking of Dr. H, can I just say he is my hero. Seriously he is. He has a way of making my kids feel at home and secure and their momma too. Meredith didn't even shed a tear when the came to get her and take her back to the OR. She gave us a kiss and was wheeled away with a loopy smile on her face. Loopy due to the drugs they gave her to relax, but still no tears. Dr. H then came out to tell us, that she was happily blowing up the balloon, a tactic they were using to get her to sleep. He's a fabulous doctor and I am so happy to have a wonderful ENT in our lives, especially with the rampant ear infections we have experienced lately. Anyway bright and early this morning I learned the 5-7 minute procedure that I was expecting like when Noah got his tubes was not going to happen. Apparently it is alot more involved when you remove someones adenoids and that takes 25-30 minutes. Yes, that is a huge deal. And for those that think it isn't.....when it is your baby, it totally is. Anytime it is anything having to do with one of your babies it is a VERY BIG FREAKING DEAL. Can you tell I have been harboring some feelings on people trying to blow off my concerns and worries about the surgery? All in all the procedure was great. Meredith came out of recovery fast asleep and slept really well for the next hour. She then woke up and looked at Josh and I and told us "you woked me up too early!" Then we offered her some sprite or a Popsicle and she took a sip and dozed right back off. We headed home about an hour and half after the procedure where she napped some more and then watched movies for the rest of the day. She didn't shed a tear all day, until the lady pulled the tape off her arm to remove her "princess glove" or IV and then again when we were home and she was told to share her balloon with her brother. Other than that not a single tear all day! She was a much better patient than I ever would have been. Even Dr. H commented on what a brave girl I had. She totally does not get that from me, I guess that is more of Josh in her. Although I will be the first to admit my girl is 98% her momma and 2% her daddy. I'm glad she got some of his courage when it comes to medical procedures. Maybe she will grow up to be a doctor like she wants. I have no idea when she got so big and brave? When she decided she could face some of the world on her own...she's growing up and although it pains me that it is happening too fast, I love the little girl she is growing up to be. My brave big girl getting ready for her tubes. 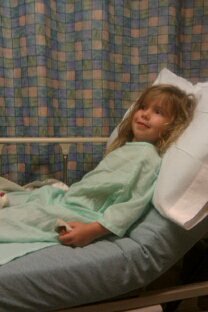 And although she was such a big girl going back with the nurse and CRNA. I was happy she came back looking more like my baby and sleeping soundly. Thanks to all of you for the prayers and well wishes! She did fabulous and has made almost a complete recovery by tonight. I am so thankful for that. I was expecting the worst and she really made it look like a piece of cake!